So the Holidays are upon us, and one of the most popular gifts for the burgeoning gearhead is a small or toy version of their real car (or car they aspire to own, or don’t have a realistic chance of owning, or an aircraft, ship etc). Often times these gifts end up as “glue bombs” or punished as if they were sturdy toys with wheels, mirrors, doors and glass soon gone AWOL. Either outcome can end up a frustrating experience for the end-user who often feels deficient at being able to make a product that exactly matches the box and consequently the hobby as a whole (ask me how I know). Here’s a brief introductory guide for the novice or younger kit builder to provide at least some degree of protection against this plastic-induced frustration. It doesn’t matter if you’re writing the Great American Novel, a product review or selecting a gift for a relative, loved one or yourself: the first step is to know your audience. In this case, you want to have at least some idea of the likely skill level of the potential model builder, and age and maturity are going to be perhaps the biggest factors. All plastic model kits have a recommended age - the kit in the topshot for example has a very visible “8+” recommendation but I would say plastic model kits, even in entry-level novice form, might be best reserved for 9 or even 10-11 year olds. For children who are younger and particularly like to thrash things or expect a high degree of playability, you might want to consider other options. The standard fallback, of course, are LEGOs: there are a number of great LEGO kits out there for less than $15 or even $10, comparable to a typical entry-level plastic model kit. There are other construction, engineering or STEM-friendly toys with greater durability and playability as well, from Lite Brix to Tinkertoys, and other such toys that can be found at Toys R Us, Walmart, and educational toy boutiques. For both the tween builder and novice builder of any age, it’s hard to beat the snap-construction kit. It’s not the only type of entry-level model construction technique or type out there, but it tends to be the most popular for a variety of reasons - the kits themselves are cheaper; the kits tend to have at least some degree of playability; the kits tend to be fairly sturdy for 100% polystyrene or PVC construction (the two most popular types of injected-molded plastic - diecast snap-construction kits tend to be uncommon, but not exactly rare); and the kits tend to be engineered with the little tyke builder in mind, with fewer parts that represent a choking hazard (compare to the tiny metal screws on screw-construction kits). Along those lines the parts usually compe pre-painted in some fashion, usually with the colors directly molded into the plastic or with stickers or decals already pre-applied inside the sealed box. Literally, all you do is free the part from the plastic sprue tree and snap them together - what modellers like to call “shake ‘n bake.” Snap-construction kits also tend to have a fairly large number of moving or other “gimmicky” parts, or some other novelty built into the kit other than the subject matter itself. These may include opening and closing bomb doors or retractable landing gear on aircraft, snap-shutting and opening S-Foils on Star Wars X-Wing kits, or in some cases even LED lighting. Due to engineering concerns (namely trying to make the part sturdy enough to take repeated abuse), it may come at the expense of kit accuracy; having hilariously huge hinges on a B-17’s bomb doors that make it obvious it’s closer to a toy, for example. 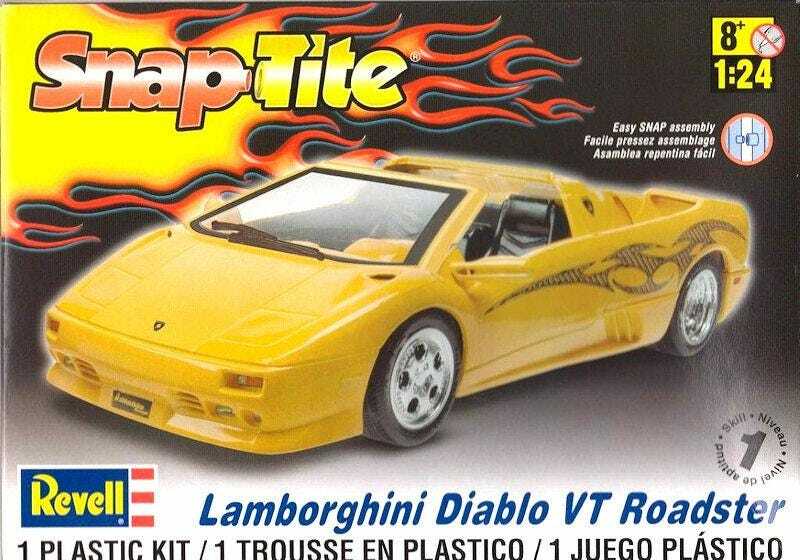 On automotive models it may include many features found in higher-end 1:64 diecast cars, such as hoods/bonnets, doors and other lids that freely open and close - or if you get a particularly cheap “curbside” model the only feature you’ll get are spinning tires. Perhaps the second most popular option for starter and entry-level kits is the screw-together type. Again, the name pretty much tells you what it is - you use screws to assemble a plastic or die-cast metal (most entry-level diecast model kits that require assembly will be of this type). Again, most of the parts will either be pre-painted or come with stickers or decals already applied within the box. These tend to be aimed at older builders looking for a more serious and accurately detailed static display or desk model, but may lack the skills or desire to buy all the tools necessary to assemble a detailed plastic model. Motorcycles and military aircraft tend to be very popular subjects. Perhaps the biggest trade-off, particularly with “lesser” kits, are visible screw holes. Fortunately for most budding sci-fi geeks who can’t get enough of The Force Awakens on-screen, most of the Star Wars line carried by Revell are snap-construction kits. Again, kind of hard to go wrong here. And of course pretty much any muscle or exotic car will keep both little boys and girls pretty happy too. Testors (yes the people who make all that model paint in those quaint little glass bottles) also has a number of decent kits of mixed snap-together and screw-together construction, available in all-metal and mixed-media construction. These represent a wide variety of subjects and scales including modern military helicopters, jets and cargo transports; classic and iconic WWII fighters; and tanks, jeeps and other vehicles used from WWII to the present including the mighty U.S. Army M1 Abrams. Maisto also has a good selection of diecast screw-together kits, particularly for people who think two wheels are good. From there, and once you feel you’ve outgrown pre-painted snap-construction kits, you can venture into the world of sniffing glue and struggling to paint straight lines. The variety is way too staggering to condense into a comprehensive yet breif guide, but there are some rules of thumb: “intermediate” kits will be of all-plastic construction, while those that require advance skill will throw in resin or etched metal components, or be completely vaccum-molded from resin. Kits that are of a very large scale or subject matter, or conversely kits that are very small (and either way require handling many, many very tiny parts) will typically require advanced skills and technique supplimented with the right tools as well. Revell (and Monogram that came before) likes to push their “skils guide” but for the most part it’s meaningless babble - two “Skill Level 2” kits can have wildly varying ease of construction or may have flaws in the engineering or molding of the kit itself that can make assembly maddening (again, ask me how I know). If you’re ready to head out into the model kit world, the best thing would be to do your own research and reach out to the plethora of communities out there - the aforementioned International Plastic Modeler’s Society (both online and through your local chapter), or the Aircraft Resource Center that’s been helping to guide modelers with their large community for well over 15 years. Don’t forget the right tools, too - the more knives you have on hand, the better. A high-quality glue applicator (as opposed to just slathering glue straight from the orange tube) is the best means of preventing your $40 kit turning into an ugly glue bomb. And get a good quality airbrush - the quality of the paint matters less than the quality of how it’s laid down. Again, reaching out to the vast number of communities out there will do wonders for guiding you on what tools to get, how to use them and how to maximize their benefits.